1. Continuous service for just a few customers. Businesses that sell products must find large numbers of customers that purchase only a few times. Lawn mowing businesses, however, have a set list of customers that purchase time and again. This means once you find your customers, you do not have to be constantly finding new ones. Also, having only a few customers allow you to have a close relationship with them. There is a softer side to lawn businesses: Not only do you sweat in the sun, you also work with people. 2. High profits, low expenses. Most businesses have a profit margin of about 20%, if they are lucky. Lawn business, however, usually have a profit margin of about 97%. Think about it. If you are the only one in your business, all you have to pay for is oil and gasoline for your mower, and sometimes new equipment. Even if you have a larger business, you still only have to pay for employees, trucks, and maybe a secretary, but then you aren’t doing the manual labor. 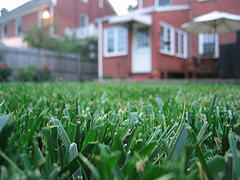 With a lawn business, you are are going to have high profits and low expenses. 3. You don’t need special skills. When I first was thinking about starting a business, I made a list of what marketable skills I had. To be honest, I was pretty stumped. Some people tutor guitar, but I wasn’t good enough to teach someone. I’m not so good with computers, and I can’t fix bikes. Most teenagers are not good enough at something to market it to other people. Heck, we haven’t even gone to college yet! However, anyone can learn to mow a lawn in half an hour. Of course, there are finer points to lawn mowing, but those come with time. You can make a lot of money simply because people don’t feel like doing it or don’t have time to. 4. There is work for every season. At first thought, a person might believe that mowing lawns is only a spring and summer business. Well, it was, but then your customer asked you to rake leaves in the fall. Then, in the winter, you thought you were going to have a fun snow day off of school. Nope, you have to make $300 dollars shoveling snow. As you can see, lawn care is not limited to a single season. You can make money all year. For a lot of people (haha, even for people staring at a computer screen right now like you) working outside is appealing. Everyone will think your farmer’s tan is manly. Plus, mowing lawns will help keep you in shape, if coupled with a healthy diet. Mowing lawns is plain good exercise. I personally believe that mowing lawns is a fabulous way for a teenager to make money. You can make a lot of cash, and have a lot of fun running the business. This post was contributed by Ben Foster. Ben is a young entrepreneur who has his own teen lawn mowing business as well as a teen lawn mowing blog. Ben has also graciously written a review of the Official JuniorBiz Lawn Mowing Guide. He is a very nice person. Thanks for everything, Ben! Ben is a young entrepreneur who has his own teen lawn mowing business as well as a teen lawn mowing blog. He has also graciously written a review of the Official JuniorBiz Lawn Mowing Guide. Ben has written 1 article(s) for JuniorBiz.com.